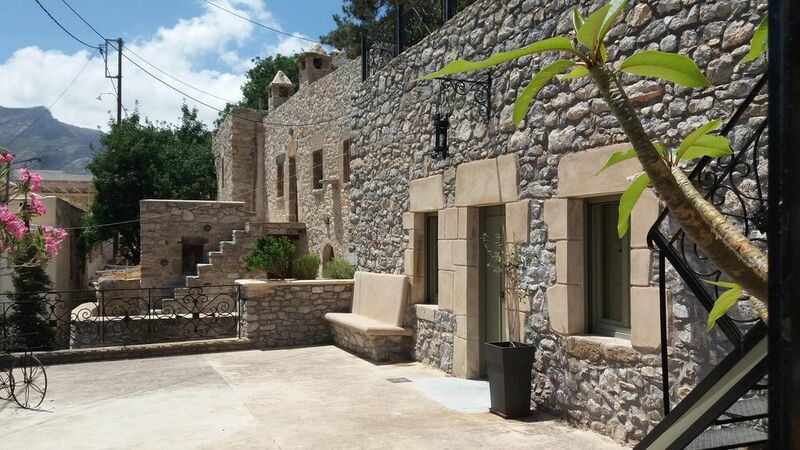 Beautifully renovated stone built house in the centre of Megalo Horio village. Located in the heart of the quiet village of Megalo Horio, this studio style house comprises of a double and single bed with the option of an extra mattress ideal for a couple or small family. Incorporated in the house is the newly fitted kitchen and attached bathroom. Outside there are two terraces with stunning views of Eristos bay and mountains all around. High speed internet and air conditioning are included and we will meet all guests at the harbour and bring them up to the house. In the village there is a wonderful, traditional kafenion nearby as well as the family run To Kastro restaurant, owned by the same family for more than 30 years. There is also a regular bus servicing the whole island and many scenic walks from the house. The house is beautiful, very well equipped and very tastefully decorated. Megalo Chorio is a beautiful, traditional Greek village and a really friendly place to stay. It does have narrow, steep winding streets though, so be prepared! The house is situated right at the top of Megalo Chorio with amazing views out to Eristos bay. The owners, Maria and Christopher, couldn't have been more helpful before, during and after our stay. We thought really hard about any suggestions we could give them to improve the place and could not think of anything. Everything was perfect! My partner and I agree that this was the best holiday we have ever had and we will definitely be back. Staying longer next time though!